THE NAME of T. Paine will be familiar to students of the penny blood for the handful of serials he published in 1840-41 from his premises at 20 Holywell Street, Strand. But he has hitherto been forgotten and overlooked, probably because his career as a publisher was so short. So who, exactly, was he? He was born Thomas Paine Carlile, the fourth son of Richard Carlile, the radical publisher and champion of the philosopher and political theorist Thomas Paine (1737-1809), author of Rights of Man (1791) and The Age of Reason (1794-1807). RICHARD CARLILE, born in Ashburton, Devon, on 8 December 1790, spent many years as an itinerant tinworker before marrying Jane Cousins (1791-1843) in 1813, and settling in London. They went on to have five children: Richard (b.1814), Alfred (b.1816), Thomas Paine (born 1818, and died the year after), a second Thomas Paine (b.1819), and Hypatia (born 1822, and died within three years, in 1825). 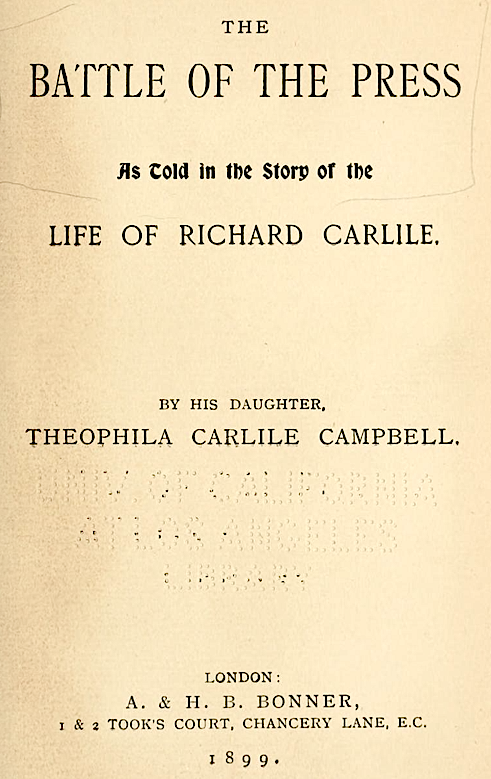 In 1817, fired by political zeal, Richard Carlile became a seller of pamphlets and journals, and later a writer and publisher, focussing on radical and other causes — which led to several terms of imprisonment. He went into partnership with the printer William Sherwin and together they published Sherwin’s Political Register. In February 1819 he established himself as a bookseller and publisher at 55 Fleet Street, but a few months after this found himself beginning a six year prison sentence in Dorchester Prison (originally three years, but extended to six following his refusal to pay a fine of £1,500) for seditious libel, for selling Thomas Paine’s works and for having published his own account of the Peterloo Massacre (in which 15 people were killed when soldiers attacked a crowd of people demanding the reform of parliamentary representation in Manchester on 16 August 1819) in his Political Register. When his shop was raided and his stock of newspapers and pamphlets (which included works by Thomas Paine) seized by the authorities, he re-launched his periodical as The Republican, only to be arrested after the first number had been issued. During his incarceration his business was carried on by his wife, and he continued issuing new periodicals, most notable The Newgate Monthly Magazine, launched on 1 September 1824 and produced by some of Carlile’s shopmen who had also been imprisoned. After his release in 1825 he opened new premises at 62 Fleet Street, and turned his attention to birth control, and rethinking his earlier anti-religion philosophy, thereby damaging his reputation. In 1827 he embarked on what became a lengthy series of lectures, and in 1831 he was sentenced to another term in prison for seditious libel, published in his short-lived periodical The Prompster, during which he formed a relationship with Eliza Sharples, an advocate of women’s rights — he and his wife Jane subsequently separated, Jane setting up in business as a bookseller on her own, and in April 1833 Carlile and Sharples had their first child, Julian, born out of wedlock and thereby damaging Carlile’s reputation even further. Several more short-lived periodicals followed, including The Political Soldier, The London Star, Phoenix, The Church and Carlile’s Political Register, none of which lasted for more than a handful of issues. At the time of the 1841 census, he was living in Old Road, Enfield, with Eliza and their children Richard, Hypatia (b.1836), and Theophila (b.1837). He continued to lecture, but financially he was insecure, and he even became estranged from Eliza, who moved to Devon with their children in 1842. In January 1843 he moved from Enfield to an address in Bouverie Street, Fleet street (probably No 1, the home of his son Alfred), and launched The Christian Warrior, a weekly periodical which reflected his atheism, a position he had slowly come to adopt over the previous ten or so years. He only saw three numbers off the press, however, as he died on 10 February 1843. His death received a lot of publicity, with some newspapers describing him as “an extraordinary man” and others as “a notorious infidel”. He had bequeathed his body to St. Thomas’s Hospital, where it was subsequently taken and used for an anatomy lecture before being dissected by students. FUNERAL SERVICE. His funeral took place on 26 February 1843, and this, too, attracted a lot of publicity, albeit for an unusual reason. After a delay of an hour, the cortege, consisting of a hearse and five coaches, left Bouverie Street and made its way to Kensal Green Cemetery, in Willesden, arriving at just before five o’clock after a two-hour journey. When the Rev. Josiah Twigger was about to start reading the burial service, Alfred Carlile stepped forward and on behalf of the family objected: “Sir, we protest against the performance of this ceremony. Our late father lived and died in opposition to priestcraft of every description, and we, therefore, protest in his name against the service being read” (as reported in several local newspapers). The clergyman insisted that he had to carry out his duty, and after Richard Carlile jnr. pointed out that the grave had been bought for the family and they did not want the funeral service to be read, Thomas Paine Carlile urged everyone to leave, which they did, leaving the Rev. Twigger to conduct the service in front of the sexton and two other people. HIS SON RICHARD. His first son, Richard Carlile jnr., was born on 25 March 1813, and worked as both a publisher and a newsagent, although he published very little on his own account. In December 1833, operating out of 26 Bride Lane, Fleet Street, he joined forces with R.E. Lee, of 31 Marylebone Lane, to publish The Man: A Rational Advocate, which had been launched in July 1833 and which ran until August 1834. 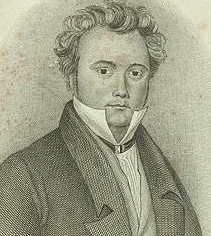 In 1834 Richard Carlile jnr. published a reissue of Defensive Instructions for the People, containing the new and improved combination of arms, called Foot Lancers; miscellaneous instructions on the subject of small arms and ammunition, street and house fighting, written by Francis Macerone and originally published in 1832. In 1836, operating out of 137 Fleet Street, he began issuing a threehalfpenny weekly Library of Romance, or Journal of Fiction, which comprised pirated works by authors such as Sir Walter Scott, Mrs S.C. Hall, Leigh Hunt and G.P.R. James. It was later reprinted, or continued, by Orlando Hodgson of 111 Fleet Street, under a slightly different title. At the time of the 1841 census Richard Carlile jnr. was living in Belgrave Terrace, Shoreditch, described as a newsagent, with a wife (Maria, born in Ireland around 1816) and three children. In 1842 he was listed in the Post Office Directory as a newsagent at 2 Water Lane, Fleet Street (presumably with his mother — his younger brother Alfred had also been living and working from there, although he appears to have given up his business), and a year later at 2 Paul’s Court, Huggin Lane (in the City of London), again as a newsagent. According to Theophila Carlile, he inherited his father’s business and stock of books on his father’s death, alongside a small annuity, while Eliza Sharples inherited only his furniture and personal possessions. He emigrated to America after a while, and settled in Winsconsin, where he was elected to state’s House of Assembly. He died in New York in 1855 of “ship fever” (i.e. epidemic typhus) which he had contracted during his return to America after making a trip to London, leaving a widow and nine children. In 1837 he moved to 137 Fleet Street, from where he issued The Phoenix, or The Christian Advocate of Equal Knowledge, a short-lived periodical which ran from 5 February to 5 March 1837, and Mirabaud’s System of Nature. In 1838 he moved to 2 Water Lane, Fleet Street, from where he published a reissue of his father’s Every Woman’s Book, or What is Love?, an early tract on birth control. He also issued the short-lived Carlile’s Political Register, which ran from 19 October to 14 December 1839. 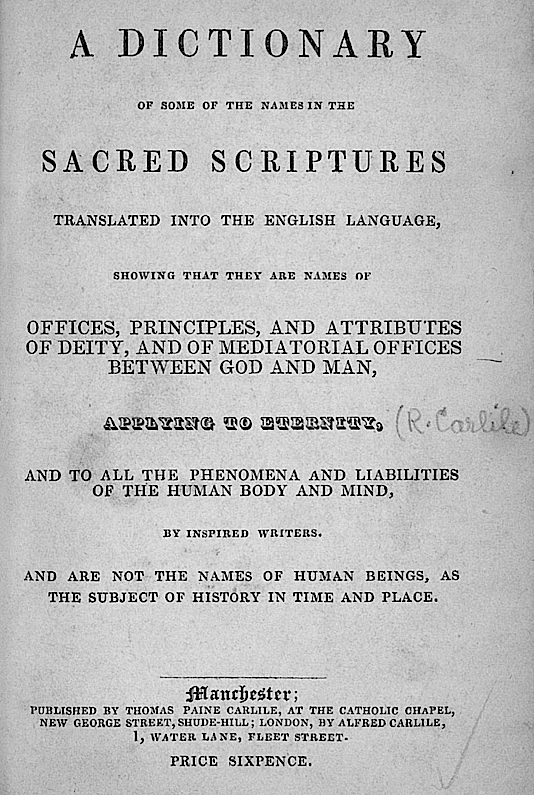 Also in or around 1839, from 1 Water Lane, he issued, in partnership with his brother Thomas Paine Carlile, who was working in Manchester, A Dictionary of Some of the Names in the Sacred Scriptures Translated into the English Language, written by Richard Carlile and based on writings by Eliza Sharples. He also advertised as a newspaper agent supplying bulk copies of all London periodicals and newspapers at a much lower price than his competitors, charging a commission of just 5% on top of the actual wholesale price. He was still at 2 Water Lane at the time of the 1841 census, living with his mother. At some point he became the proprietor of City Hall, 110 Chancery Lane, which was used for lectures and public meetings, but in May 1842, having given up his publishing business, he found himself in a debtors’ prison (London Gazette, 27 May 1842). After appearing in the Court for the Relief of Insolvent Debtors in July, he was discharged from his bankruptcy on 15 August 1842. The following year he was back in business at 1 Bouverie Street, publishing another short-lived weekly, The Royal Album of Literature and Art. By 1845 he had apparently opened a shop at 103 Strand, where he sold books and prints under the name of “Ward”, and it was his activities here that led to him being tried at the Old Bailey on 15 September 1845 for selling obscene prints. As was often the case in the mid-19th century, the prosecution was brought about by the Society for the Suppression of Vice, whose representative visited his shop in July 1845 and bought three French prints, shown to him in a back room, which were adjudged to be obscene. Two witnesses were called by his defence to testify as to his good character, one of whom told the court that he used the name Ward as “he did not like the name of Carlile on account of his father’s notoriety” (Old Bailey transcript). Despite his good character, he was found guilty, and detained in custody in Newgate Prison until he was formally sentenced in October 1845 to six months in prison. He died two years later. “Sir, Will you allow me to correct an error in your report of the proceedings at the Central Criminal Court, which appeared in Tuesday’s paper, and in which one Alfred Carlile, a son of the late Richard Carlile, is said to have appeared on a charge of misdemeanour? I being the only Alfred Carlile in the family of the late Richard Carlile, shall be subjected to much inconvenience and annoyance if the report referred to is not contradicted. The explanation for this lies in the activities of Richard Carlile’s third son. HIS SON THOMAS PAINE. His third surviving son, Thomas Paine Carlile was born on 30 November 1819, and baptised in the parish of St. George, Bloomsbury, on 16 February 1820. He seems to have begun his career as a bookseller in Manchester — it was from premises at the Catholic Chapel, New George Street, Shudehill, Manchester, that he jointly published his father’s A Dictionary of Some of the Names in the Sacred Scriptures with his brother Alfred, and it was also in Manchester that he married his first wife, Charlotte Ward, a year younger than him and the daughter of Samuel Ward, a coachman, in the Chapel of Hulme, on 11 December 1838. His address at the time was 42 Bradshaw Steet, Hulme. They had a son, Richard, born in October 1839, after which they moved to London, where Thomas began working as a publisher and wholesale newsagent at 22 Bride Lane, Fleet Street. His first work from this address appears to have been a 16-page pamphlet on political reform written by his father, issued under the imprint of “T. Paine Carlile”. As T. Paine he began issuing a number of periodicals and serials — The Book of Gems, The Renowned History of the Seven Champions of Christendom, and The Life and Adventures of Bampfylde Moore Carew. King of the Beggars (in 12 weekly parts). From his Bride Lane premises he also advertised as a supplier of London periodicals and newspapers to country agents, at the same time as his brother Alfred, which suggests they may have been no love lost between them. In June 1840 he began issuing, in penny weekly parts, Fatherless Fanny and The Children of the Abbey, followed by Parley’s Penny Magazine for Youth (presumably very short-lived, as no copies appear to have survived), and, in July 1840, St. Clair of the Isles, or The Outlaws of Barra; The Beggar Girl, or The Child of Fate; and The Farmer of Inglewood Forest. 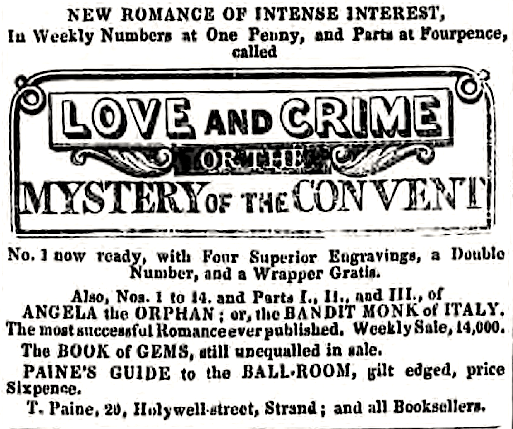 In September 1840 he advertised the first number of Angela the Orphan, or The Bandit Monk of Italy. All his advertising was in The Odd Fellow, a weekly published by H. Hetherington at 126 Strand, and, indeed, it is only through his advertisements that many of his publications are known, as very few have survived. In late October 1840 Thomas moved to 20 Holywell Street, Strand, from where he issued a handful of other penny-part serials, including William Tell, the Hero of Switzerland; The Black Forest, or The Solitary of the Hut: A Legend of Hornby Castle; and Love and Crime, or The Mystery of the Convent. Other works issued by Thomas from Holywell Street include Paine’s Handbook to the Ball-room; The Keepsake, or Friendship’s Offering (another very short-lived weekly), and a series of lithographed plates, threepence plain and sixpence coloured, of The Drunkard’s Progress. He appears to have stopped advertising in early July 1841, and certainly nothing else bearing his imprint appears to have been published after 1841. At the time of the 1841 census he was recorded, as Thomas Carlile, at Holywell Street, described as a bookseller and living with his wife and first son. They had a second child, Charlotte Jane, born in September 1841. The Sacred Scriptures, ca. 1839. It therefore appears that it was Thomas Paine Carlile who was selling indecent prints from his shop in the Strand, and that he gave the police and the court the name of his brother. He was later listed in the 1847 Post Office Directory as “Thomas Ward, Importer of French Prints”, at 103 Strand, but whether or not he was still in business is open to doubt. It was, presumably, Thomas who was taken to Newgate and subsequently spent six months in prison, and not Alfred. NO TRACE. There is no trace of Thomas, Charlotte or their children in the 1851 census, although in the same year a Thomas Ward & Co., booksellers and publishers, was listed in the Post Office Directory at 27 Paternoster Row. Charlotte died in September 1852, and Thomas married for a second time on 14 January 1854, at All Hallows Church, Tottenham. His wife was Fanny Wright, born in 1835 and the daughter of William Wright, a licensed victualler from Tottenham. They went on to have three children: Fanny (b.1857 in Bedford Square, Bloomsbury), Thomas (b.1858 in Lambeth), and Charles Alfred (b.1859 in Camberwell). “THOMAS PAYNE”. At the time of his second marriage, Thomas was described as an Agent — in the 1861 census, he was living in Southwark as Thomas Payne (differently spelled), and described as an accountant’s clerk, with Fanny and his son Charles. His other two children were living with his wife’s father in Camberwell. In 1871 he was still living as Thomas Payne, at 43 Primrose Hill, St. Bride’s, working as an Agent to a Joint Stock Company. He died in London in October 1878, apparently intestate. His wife died in Islington in 1908. 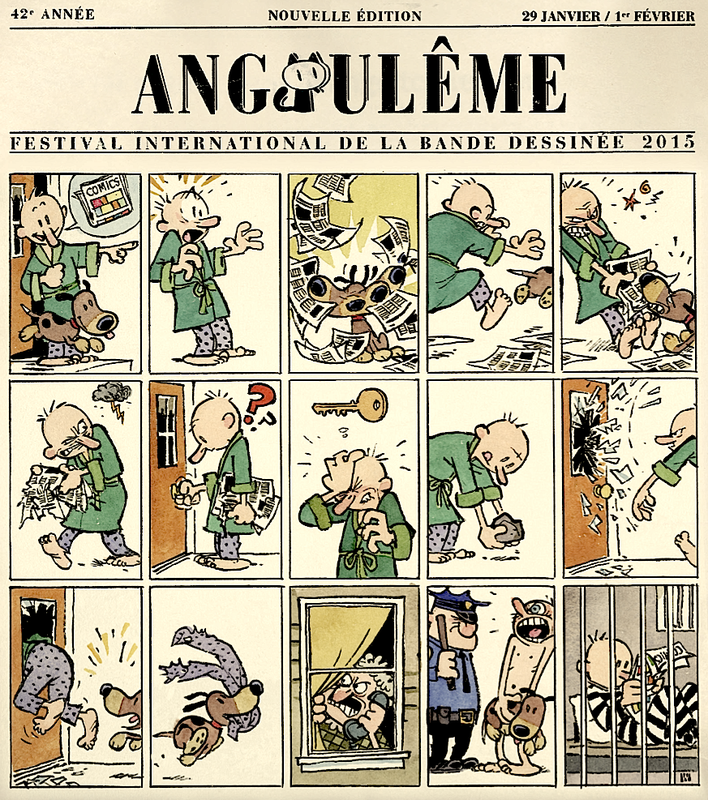 JUST RELEASED — the poster for the Angoulême Festival international de la bande dessinée, edition 42, near Bordeaux in France, January next. Designed in the shape of a mammoth-sized silent comic strip by this year’s laureate Bill Watterson (b.1958), the American cartoonist who in late 1985 became a world player with his Calvin and Hobbes, a hugely successful newspaper comic strip he stopped after ten years. Watterson’s poster — Mupi sizi 175 x 118,5 cm — wil grace every street corner during the festival. 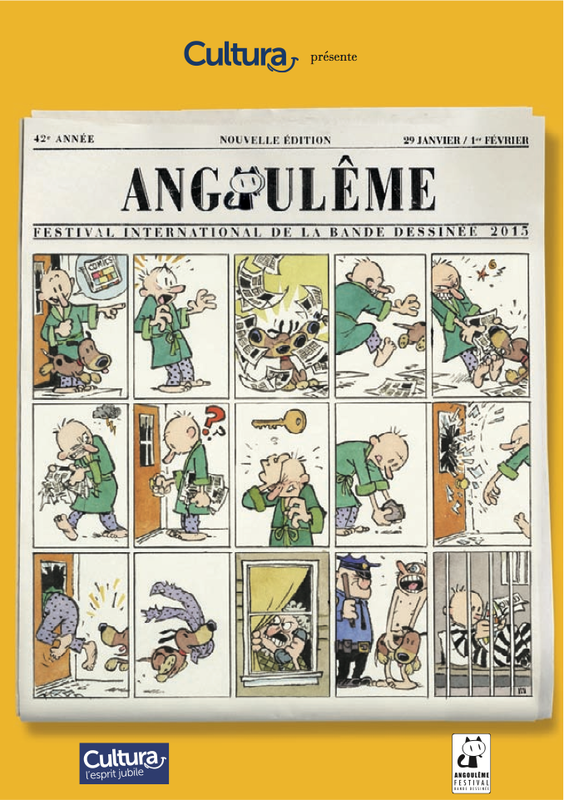 The major exhibitions in Angoulême this time will be on Watterson’s Calvin and Hobbes, on Tove and Lars Jansson’s Moomin, and on the work of Jack Kirby and Jirô Taniguchi — see HERE. EXACTLY TWENTY YEARS — after ceasing Calvin and Hobbes, the cult series that made him world-famous, and a few months after being awarded the Grand Prize by the Angoulême festival, the American artist Bill Watterson agreed, against all odds, to take up his pencils and brushes again in order to create the official poster of the festival’s 42nd edition. An artistic gesture of exceptional value, unexpected and generous, and a declaration of love and faithfulness to the comic strip of which Watterson remains one of the most notable practitioners. In 1995, after only ten years, Bill Watterson decided to end the publication of Calvin and Hobbes, retiring from comics and public life. Exhausted by the pace of daily publication and the struggle against the commodification of his strip, the author felt no more desire to draw. Since then, legend has it he spends most of his time painting, away from the crowd, perhaps even under a pseudonym. 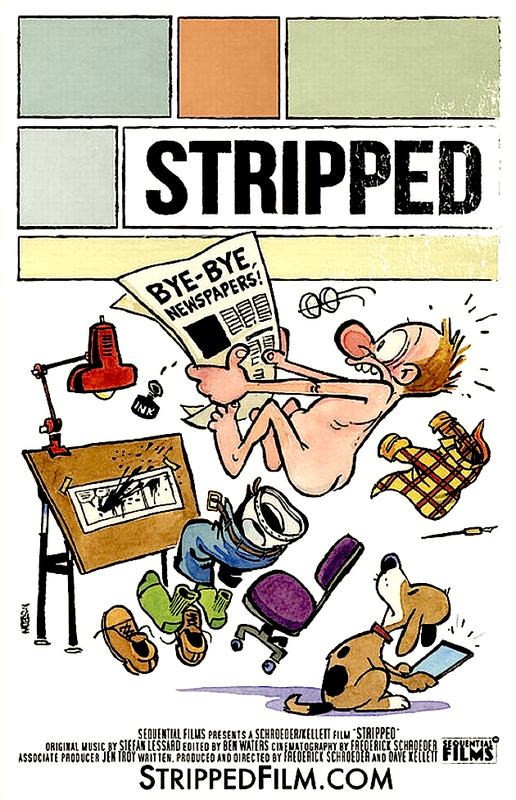 Watterson poster for Dave Kellett & Fred Schroeder’s 2014 documentary Stripped. A secret personality of sorts, rare public statements and virtually no photographic documentation available… Bill Watterson, whose reputation now seems inversely proportional to his media exposure, is to comics what J.D. Salinger or Thomas Pynchon are to literature: a world-famous, unknown personality whom many believed that nothing could get him to draw again. However, in early 2014, one or two discrete initiatives augured a possible change. In the spring he signed a poster for a documentary about comics, Stripped, an occasion on which he gave an audio interview for the first time. A few weeks later, he made three drawings for the American author Stephan Pastis, which were later sold at an auction in benefit for research against Parkinson’s disease. Watterson wrote a foreword to a 328-page book on Puck, released in October and titled The Story of Puck; America’s first and most influential magazine of color political cartoons; What Fools These Mortals Be!, by Michael Alexander Kahn & Richard Samuel West. 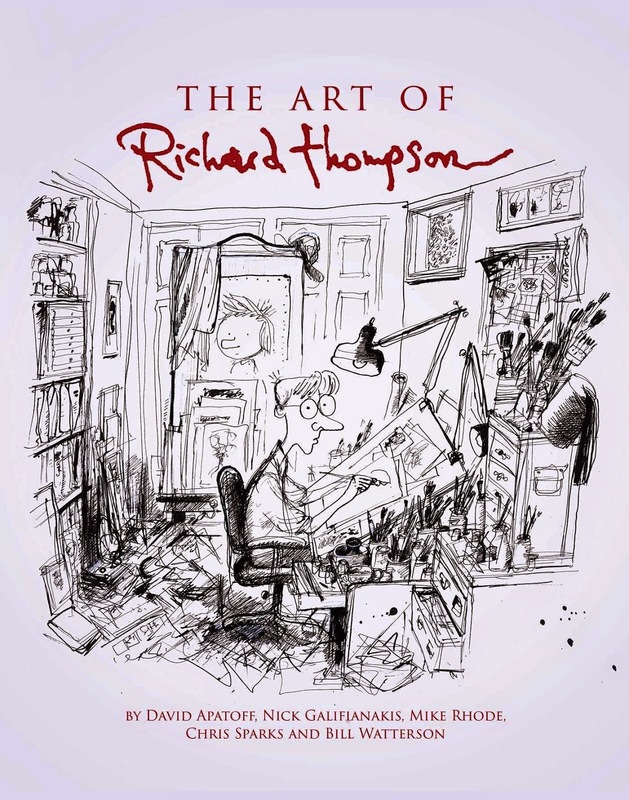 And Watterson contributed a conversation with his fellow-cartoonist Richard Thompson (b.1958) to a 224-page book — titled The Art of Richard Thompson — to be published on the 25th of November 2014. But still no comics on the horizon since twenty years. This makes his poster for next year’s Angoulême Festival even more unique. After months of reflection and sustained dialogue with the Festival’s programming committee, this comic strip creation is a perfect synthesis of what embodies Bill Watterson today: the last major upholder of the typically American comic strip, comics that are organically linked to daily newspapers. A vision of entertainment and reading as catharsis in a hostile world. Bill Watterson has honoured the festival by designing, for the first time since 1995, a 15-box strip cartoon, silent and therefore universal, expressing his undying love to comic strips. A brand-new strip by Bill Watterson, signed ‘W’. 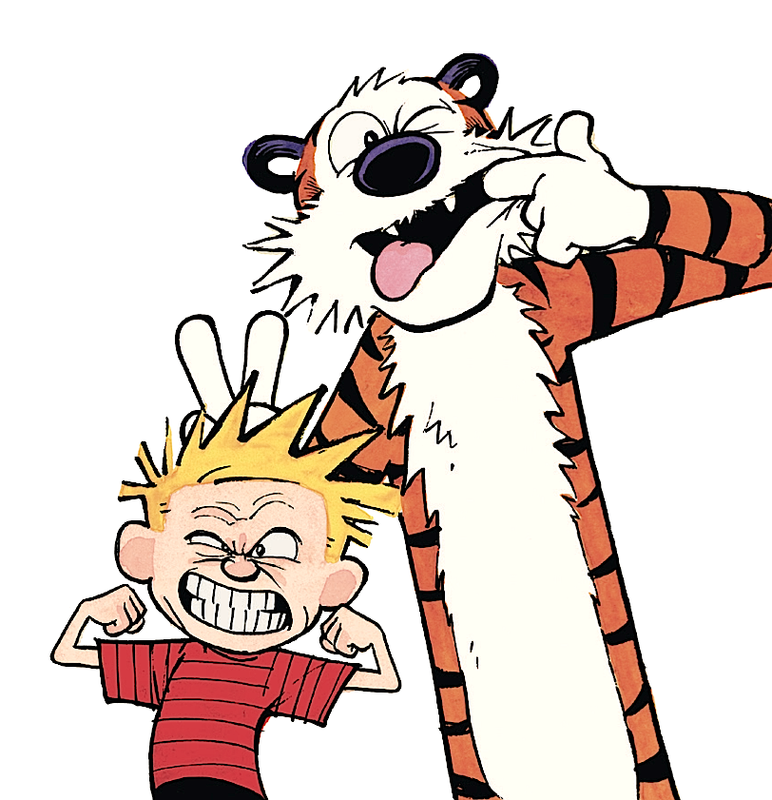 Neither Calvin nor Hobbes are present in it; Watterson says he abandoned them too long ago to draw them again. But their moral and philosophical legacy continues to radiate through each image he creates. Watterson, by stubbornly refusing to yield to publishers’ dictates, became one of the few to decisively change the culture of comic strips. An author who reminds us how reading comics can remain an inexhaustible source of happiness for each and everyone of us. Q. Where does the idea of the poster come from and what did you want to express with it? BILL WATTERSON: I wanted to have the poster loosely relate to my own work and still be somewhat relevant to all the different kinds of cartoons that the festival celebrates. I went through a lot of ideas and approaches that didn’t work, but finally came up with the idea of making the poster a comic strip about reading the comics. I chose to depict the non-digital world of the morning newspaper as a sort of a joke on myself and how long ago my work was published. The poster circles around this again by presenting my cartoon as if it were in a newspaper Sunday comics section. But mostly, I just wanted the cartoon to be fun to look at. This is always what I tried to do in my own work. 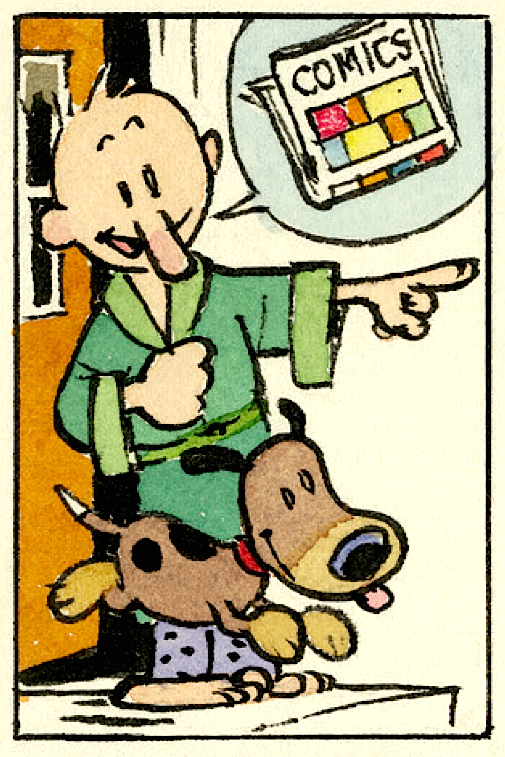 Watterson 1987 self-portrait in Honk magazine. Q. As an artist you’re interested in a variety of disciplines, such as painting. And in many interviews you’ve expressed your thoughts about the creative process, about comics as a medium of expression. From your point of view, what makes comics unique? BILL WATTERSON: By combining words and images, comics are incredibly versatile — they can say anything. I love the comics’ unpretentious simplicity and directness — their ability to cut through the clutter and get to the essence of things. But most of all, I admire the beauty of comics. I think their expressive drawings hold their own against any other art. Q. We feel you never thought Calvin and Hobbes would become such a phenomenon, still, it became a one-of-a-kind success. What made the difference and triggered all this passion? Twenty years on now, has your look upon it changed or shifted? How do you look back on this era, and on this achievement as an artist? 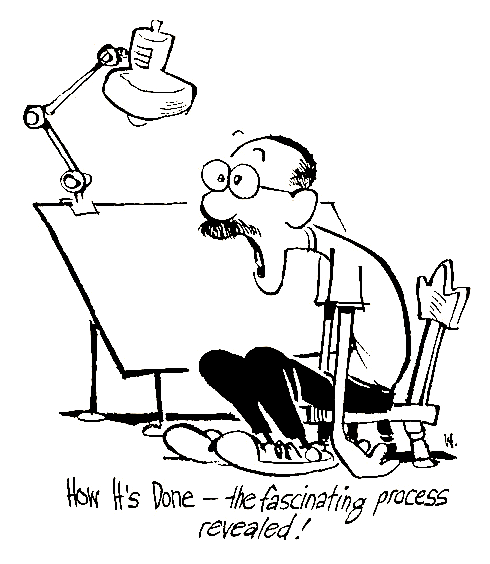 BILL WATTERSON: The only part I understand is the part that happened at my own desk — the writing and drawing. My goal was simply to make this the kind of comic strip I would like to read. I tried to write honestly, and I think my love of comics comes through the drawings, but obviously the strip’s fate was out of my control as soon as the brush left the paper. I’m delighted readers have responded to the work, but I’m as surprised by its long success as anyone. FIVE STORIES underground, deep beneath Chicago’s gothic Tribune Tower, a twenty-first-century team of photo editors is busy unearthing the city’s social history from the massive photo archives of the Chicago Tribune. 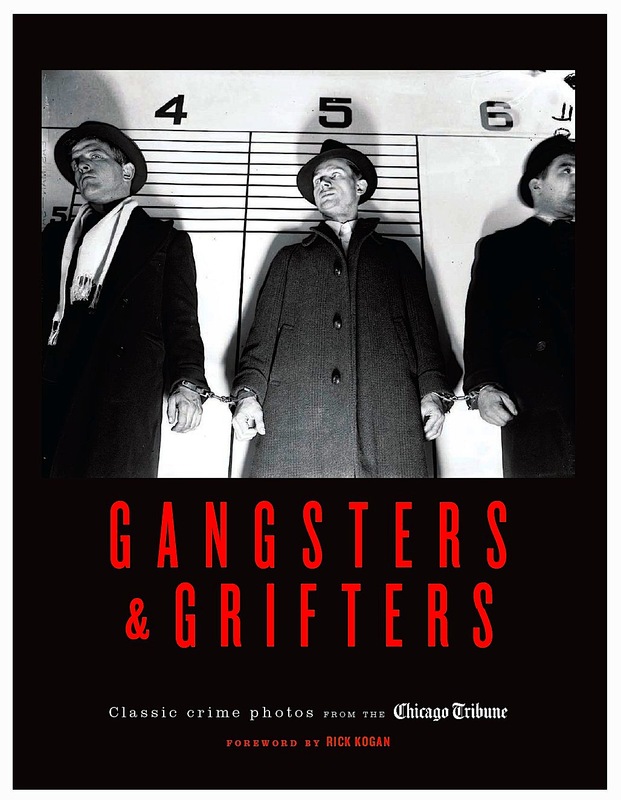 The black-and-white photographs in Gangsters & Grifters — reproduced from original negatives on 4x5 glass plates and acetate film — date from between the turn of the century to the late 1950s. Two previous collections of similar photographs from the archives were titled Capone; A Photographic Portrait of America’s Most Notorious Gangster and Chicago Portraits. In all three books each photo is described by a headline and a short explanatory text. The Chicago Tribune was founded in 1847. Its earliest illustrations were woodcuts for advertisements. During the Civil War wood repro was replaced with chalk plate engraving, followed by zinc etching in 1885, and finally by halftone engraving in 1897, which enabled the printing of photographs. DEGENERATE. Wood-engraved portrait of H.H. 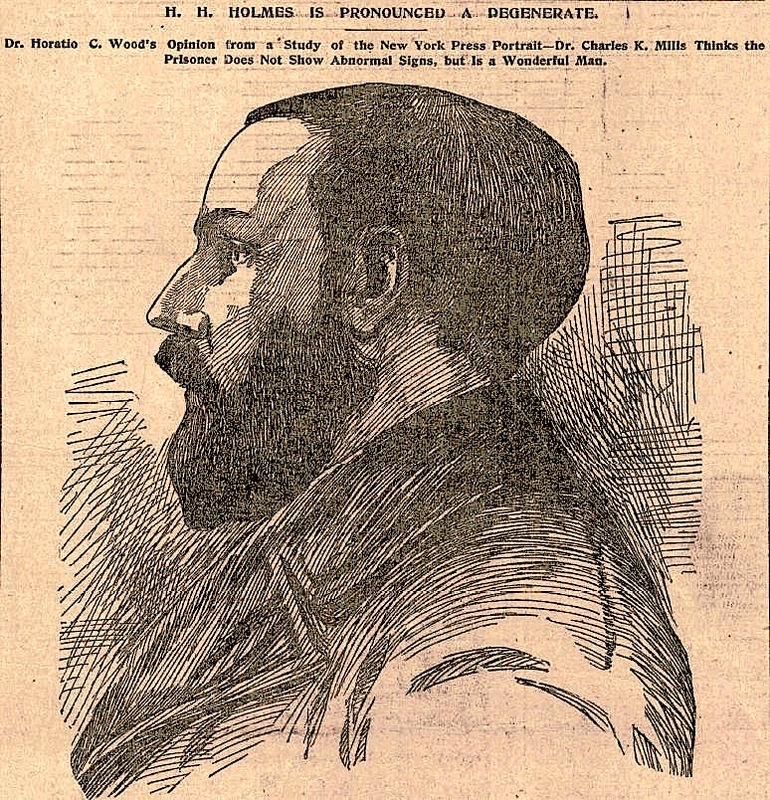 Holmes, in Chicago Tribune, November 1, 1895. MOST PHOTOS in Gangsters & Grifters were probably taken with the compact and sturdily built Speed Graphic. ‘Weegee, the Famous’ (b.1899) a paunchy New York photographer with yellow teeth who looked like he slept in his suit, used a Speed Graphic. The photographer pointed the camera at his subject from waist-level about ten to twenty feet distance. Criminals were apt to cover their faces when the camera was pointed directly at them and this technique enabled the element of surprise. A screwdriver and plastic tape were used for most repairs and the film was quick to develop. WEEGEE said in 1969 that “the camera has become a stencil, a mere recording machine to most photographers.” The pictures in this book may or may not be art but they’re still spectacular photojournalism. That “mere recording machine” caught flashlight-frozen faces of killers and their victims, relatives collapsing, and buoyant crowds swarming city crime scenes, thus granting them a vulgar immortality. WANTED. 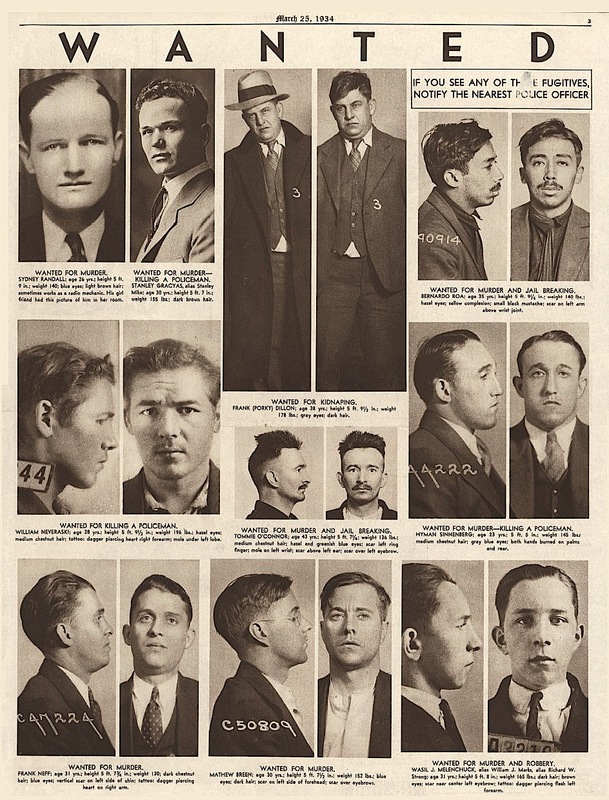 A page filled with mostly mug shots, in Chicago Tribune, March 25, 1934. HAUNTING AND UNFORGETTABLE pictures. A frumpily dressed woman lies face down on the floor while indifferent cops in fedoras search for evidence around her. After their confessions convicted killers Leopold and Loeb stare at each other in a circle of policemen. Is the look on Loeb’s face resentment, or is it the piercing gaze of a slave to love? Nineteen year old Ruth Steinhagen, shooter of Phillies first baseman Eddie Waitkus, mops the floor at the Kankakee State Hospital for the criminally insane. A woman who has just identified the body of her dead brother sits in the back of a police car with her mouth opened wide in a silent scream. A handcuffed John Dillinger glares at the photographer at a murder trial hearing in Crown Point. In one astonishing photo Dillinger lies dead on a slab in the morgue undergoing a public viewing, surrounded by thirteen men in white shirts and wife-beaters, many of them grinning. At the forefront two sisters in bathing suits raise their arms in supplication to the ceiling, faces glowing with perspiration. MASTHEAD. Chicago Tribune, November 1, 1895. DURING PROHIBITION and the Great Depression Chicago was the murder capital of the United States. Murder was the bread and butter of the crime photographers, forerunner of today’s paparazzi. The most poignant pictures are those of girlfriends and crying relatives ambushed by flashbulbs. Gangsters & Grifters is not recommended for the squeamish reader but it's a good book to lay on that nephew or niece who’s taken the wrong road in life. Just as the performers of old Appalachian murder ballads sang “people take warning” these photographs of tawdry lives and misspent opportunities strip all the glamour and allure out of a life of crime. 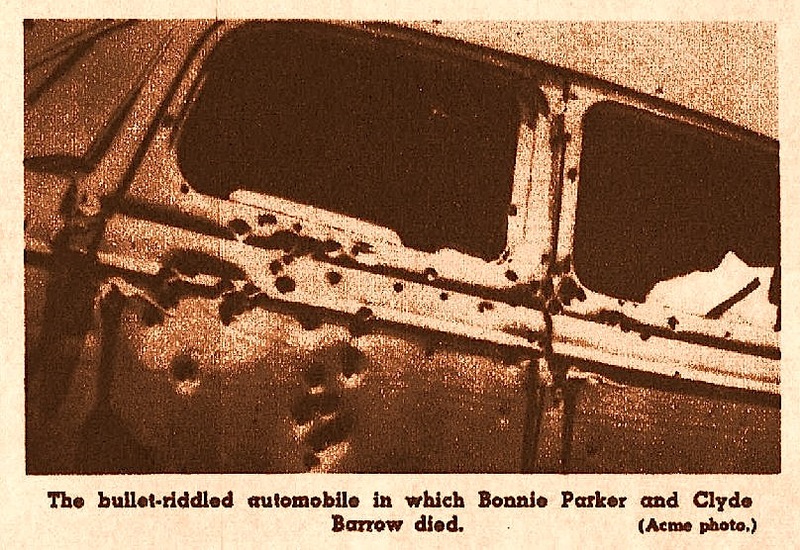 BULLET-RIDDLED Bonnie and Clyde car wreck, photo in Chicago Tribune, May 16, 1937. NOTE — Illustrations used in this article do not appear in the reviewed book.